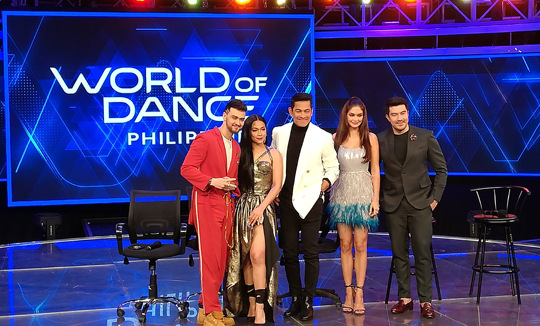 World of Dance Philippines, the local edition of the biggest dance competition in the world has continuously been the most watch weekend program in the country since it started airing a month ago according to data from Kantar Media. The program’s highest national TV rating so far, a score of 32.3 percent, was achieved on Jan. 13. Its hashtags also regularly trend and have even reached the top of the worldwide trending list of Twitter. The program, according to Billy Crawford, who sits as one of the judges in the talent reality show, is a platform that trains the spotlight on dancers, whom some people only consider as backup talents for singers and artists during their performances. “Little did many people know, dancers are some of the most hardworking people in a show. So, it’s time for us to give them the spotlight. It’s time for us to give them the attention and admiration they deserve,” Billy told Manila Standard in an interview. For Maja Salvador, also part of the judging panel, it’s a challenge for them to choose which act would move on to the next rounds of competition. “Everybody is good in this competition, but the real competition happens when they perform on the World Dance stage. There are acts that are good during rehearsals but they commit mistakes during the actual performance,” Maja shared. Echoing what Maja said, judge Gary Valenciano believes that it’s the dancers’ ability to take the drama in their life on the performance stage. “Everybody is good and has an interesting story to tell, but we’re not looking for an act that has the most dramatic story. We are looking for performers who can bring the drama on stage, turn whatever challenge they have into an amazing and exciting performance,” Gary V said. Twenty dance acts from all over the country, and the world, have already qualified to go to the next round. They have showcased different dance styles and moves, and shared different tales of triumph and hope as well. One of these is Jay, a hiphop dancer who was once part of famed dance group XB GenSan. Judge Billy was emotional upon seeing Jay, whom he had danced with on It’s Showtime. “You came here to prove, not just to us, but to yourself as well, that you still have it. And I respect you for that,” the singer and TV host said. Hosts Luis Manzano and Pia Wurtzbach also join in the fun as they interact with the contestants. The 2015 Miss Universe even did a walk-off with urban dance group Go Figure, while Luis tried to keep up with ethnic streetdance group Move to the Groove. There are more talented dance acts, funny, and heart-warming stories to watch out for in World of Dance Philippines, which airs Saturday and Sunday at 7:30 p.m. on ABS-CBN. It is also available on iWant. Also tune in to World of Dance Online, hosted by Maymay Entrata, Riva Quenery, AC Bonifacio, and Teacher Georcelle of G-Force on Facebook and YouTube. There’s an online call, initiated by GMA Network, for an immediate end to the sharing and creation of videos tagged as “The Boyet Challenge,” wherein participants imitate the lead character in the TV series My Special Tatay. The character, played by Ken Chan, is a young man with mild intellectual disability. In a statement sent to the media over the weekend, the network says it aims to spread awareness and appreciation for mentally, physically, and differently-abled people My Special Tatay. “From the start, the advocacy of the show is to help viewers understand better the plight of people with intellectual disabilities. As such, we are one with the Autism Society Philippines in calling on netizens to treat people with autism with dignity and respect,” the statement says. “The viral videos that have been circulating on social media tagged as ‘The Boyet Challenge’ was not initiated by the program and we join the ASP’s appeal to stop sharing and creating videos ridiculing people with autism,’ it added. The statement ended saying that the network is immensely grateful for the support the show has been receiving and they hope that it continues to inspire and impart valuable lessons to their viewers.